CFS Fibreglass is proud to use review provider FeeFo. With an unsurpassed reputation for delivering genuine customer feedback, Feefo has established itself as the choice of consumer generated ratings and reviews. 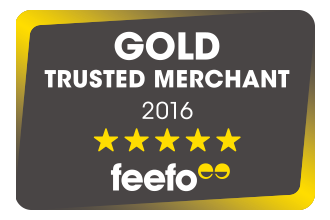 Feefo generates real reviews from real customers that have actually made a purchase from us and are therefore qualified to give a view. With a product and service rating of over 97% we have been awarded GOLD Trusted Merchant Award, a symbol of our dedication from order through to delivery. New reviews are added every single day, the instant they are posted, but don't take our word for it, click the graphic below to see what people are saying about us right now or find product reviews using the 'reviews' tab on the product detail page.